We are writing to notify you of important information about the 2018 annual meeting of stockholders of Ligand Pharmaceuticals Incorporated (the Company). We previously filed and made available to our stockholders our proxy statement and related proxy materials on May 1, 2018 (the Proxy Statement), which contained three proposals. The enclosed supplementary proxy material (the Supplement) is being sent to you because we have determined to (i) add a new Proposal 4 to the original Proxy Statement in order to approve an amendment to our Amended and Restated Certificate of Incorporation, as amended, to increase the number of authorized shares of our common stock from 33,333,333 to 60,000,000 shares, and (ii) postpone the 2018 annual meeting of stockholders, which was originally scheduled for June 14, 2018, to June 19, 2018 in order to provide additional time for stockholders to review the additional proposal and cast their vote. 1. To elect a board of directors for the forthcoming year. Our board of directors has nominated the following eight persons, each to serve for a one year term to expire at the 2019 annual meeting of stockholders: Jason Aryeh, Todd Davis, Nancy Gray, John Higgins, John Kozarich, John LaMattina, Sunil Patel and Stephen Sabba. 2. To ratify the selection of Ernst & Young LLP as the Companys independent registered accounting firm for the fiscal year ending December 31, 2018. 3. To consider and vote upon, on an advisory basis, the compensation of our named executive officers as disclosed in this proxy statement pursuant to the compensation disclosure rules of the Securities and Exchange Commission (the SEC). 4. To approve an amendment (the Amendment) to our Amended and Restated Certificate of Incorporation, as amended, to increase the number of authorized shares of our common stock from 33,333,333 to 60,000,000. The preceding items of business were described in our original Proxy Statement dated May 1, 2018 (the Proxy Statement), with the exception of Proposal 4, which is described in the attached supplement (the Supplement) to the Proxy Statement. these supplemental materials, and also by notifying you of the availability on the internet of all of our proxy materials, including these supplemental materials and the Proxy Statement and our annual report for the year ended December 31, 2017. This Supplement describes new Proposal 4, which is added to the agenda for the annual meeting and therefore is not described in the original Proxy Statement. Information about Proposals 1, 2 and 3, each of which will also be presented to stockholders at the annual meeting, can be found in the Proxy Statement as originally filed with the SEC and made available to our stockholders on or about May 1, 2018. To the extent the information in the Supplement differs from, updates or conflicts with the information contained in the Proxy Statement, the information in the Supplement shall amend and supersede the information contained in the Proxy Statement. Except as so amended or superseded, all information set forth in the Proxy Statement remains unchanged and important for you to review. Accordingly, we urge you to read the Supplement carefully in its entirety together with the Proxy Statement. All capitalized terms used in the Supplement and not otherwise defined herein have the respective meanings given to them in the Proxy Statement. The Supplement is being made available to our stockholders on or about June 4, 2018. This proxy statement and the Companys annual report are available electronically at www.edocumentview.com/LGND. On May 21, 2018, our board of directors authorized and approved the Amendment to our Amended and Restated Certificate of Incorporation, as amended (Certificate), in order to increase the number of authorized shares of our common stock from 33,333,333 to 60,000,000. We are not proposing any change to the authorized number of shares of preferred stock. Under the Delaware General Corporation Law, we are required to obtain the affirmative vote of the holders of a majority of our outstanding shares of common stock in order to amend the Certificate to increase the number of shares of authorized common stock. Our board of directors determined that the Amendment is advisable and in the best interest of the Company and our stockholders, and recommends that our stockholders approve the Amendment. The Certificate currently authorizes the issuance of 33,333,333 shares of common stock and 5,000,000 shares of preferred stock, par value $0.001 per share. As of May 31, 2018, there were 21,081,946 shares of common stock issued and outstanding, and no shares of preferred stock issued and outstanding. In addition, as of May 31, 2018, we had an aggregate of 2,070,522 shares of common stock reserved for issuance upon vesting of stock awards and exercise of outstanding stock options granted under our 2002 Stock Incentive Plan, as amended, or our Amended 2002 Plan, 594,738 shares of common stock reserved for issuance pursuant to future grants under our Amended 2002 Plan, and 67,394 shares of common stock reserved for issuance under our Employee Stock Purchase Plan. In addition, as of May 31, 2018, an aggregate of 7,345,460 shares of our common stock are reserved for issuance upon exercise of outstanding warrant confirmations we entered into in connection with our 0.75% convertible senior notes due 2019 issued in August 2014 and an aggregate of 1,839,940 shares of our common stock are reserved for issuance upon exercise of outstanding warrant confirmations we entered into in connection with our 0.75% convertible senior notes due 2023 issued in May 2018.
convertible into or exercisable for common stock, providing equity incentives to employees, officers and directors, and other general corporate purposes. Further, as described below, the lack of authorized shares of common stock impedes us from having the flexibility to elect to settle conversions of our outstanding 0.75% convertible senior notes due 2023 (the Notes) and the related warrants to purchase shares of our common stock (the Warrants) in shares of our common stock. We believe that the Amendment will provide us with additional flexibility to meet business and financing needs as and when they may arise. As of the date of this proxy statement supplement, we have no specific plans, agreements or commitments to issue any shares of common stock for which approval of the proposed Amendment is required, except as described herein, although we intend to continue to consider transactions from time to time that could result in such issuances. Our board of directors will determine whether, when and on what terms the issuance of shares of our common stock may be warranted in connection with any future actions. No further action or authorization by our stockholders will be necessary before issuance of the additional shares of our common stock authorized under the Amendment, except as may be required for a particular transaction by applicable law or regulatory agencies or by the rules of the Nasdaq Stock Market or any other stock market or exchange on which our common stock may then be listed. Any future issuance of additional authorized shares of our common stock may, among other things, dilute the earnings per share of common stock and the equity and voting rights of those holding common stock at the time the additional shares are issued. Additionally, this potential dilutive effect may cause a reduction in the market price of our common stock. Further, the Amendment could adversely affect the ability of third parties to take us over or change our control by, for example, permitting issuances that would dilute the stock ownership of a person seeking to effect a change in the composition of our board of directors or contemplating a tender offer or other transaction for the combination of us with another company that our board of directors determines is not in our best interests or in the best interests of our stockholders. Our board of directors however, does not intend or view the Amendment as an anti-takeover measure, nor does it contemplate its use in this manner at any time in the foreseeable future. Corporation Law, however, our board of directors may elect to abandon the Amendment without further action by the stockholders at any time prior to the effectiveness of the filing of the Amendment with the Secretary of State of the State of Delaware, notwithstanding stockholder approval of the Amendment. Our board of directors unanimously recommends that stockholders vote FOR the approval of the Amendment to the Companys Amended and Restated Certificate of Incorporation, as amended, in order to increase the number of authorized shares of common stock from 33,333,333 to 60,000,000. Proxies submitted by the Internet or telephone must be received by 11:59 PM, Eastern Time, on June 18, 2018. A Proposals  The Board of Directors recommends a vote FOR ALL Director nominees and FOR Proposals 2, 3 and 4. For All EXCEPT - To withhold authority to vote for any nominee(s), write the name(s) of such nominee(s) below. 2. Ratification of Appointment of Independent Registered Accounting Firm. 3. Approval, on an advisory basis, of the compensation of Ligand Pharmaceuticals Incorporateds named executive officers. 4. Approval of the Amendment to Ligands Amended and Restated Certificate of Incorporation to increase the number of authorized shares of common stock from 33,333,333 to 60,000,000 shares. Note: In their discretion, the named proxies are authorized to vote on any other business properly brought before the meeting and at any adjournments or postponements thereof. 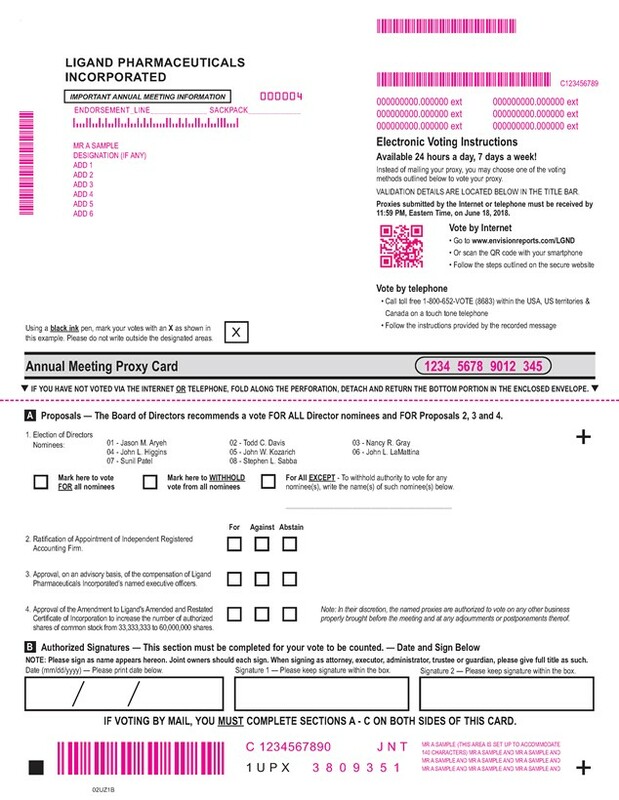 IF VOTING BY MAIL, YOU MUST COMPLETE SECTIONS AC ON BOTH SIDES OF THIS CARD. The Amended Notice of Annual Meeting, Proxy Statement, Proxy Supplement and Annual Report are available at http://www.envisionreports.com/LGND. 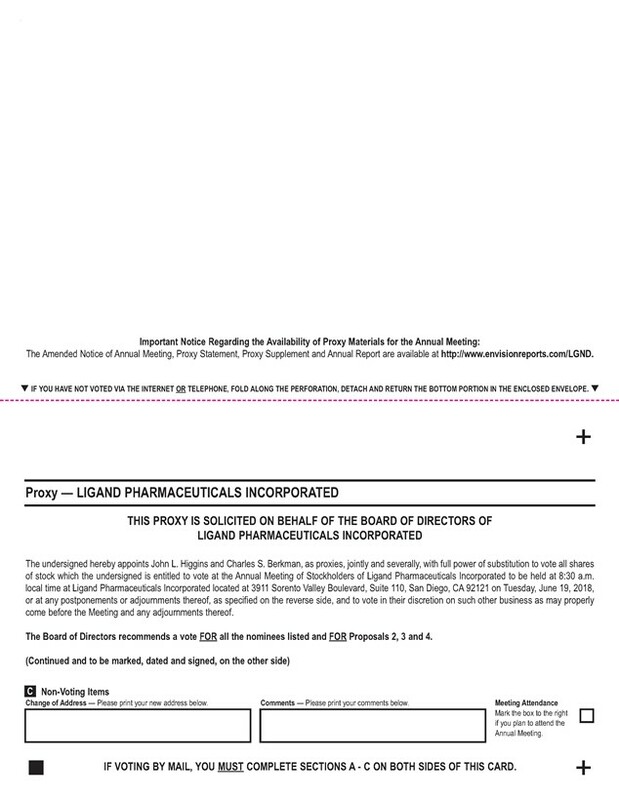 The undersigned hereby appoints John L. Higgins and Charles S. Berkman, as proxies, jointly and severally, with full power of substitution to vote all shares of stock which the undersigned is entitled to vote at the Annual Meeting of Stockholders of Ligand Pharmaceuticals Incorporated to be held at 8:30 a.m. local time at Ligand Pharmaceuticals Incorporated located at 3911 Sorento Valley Boulevard, Suite 110, San Diego, CA 92121 on Tuesday, June 19, 2018, or at any postponements or adjournments thereof, as specified on the reverse side, and to vote in their discretion on such other business as may properly come before the Meeting and any adjournments thereof. The Board of Directors recommends a vote FOR all the nominees listed and FOR Proposals 2, 3 and 4.